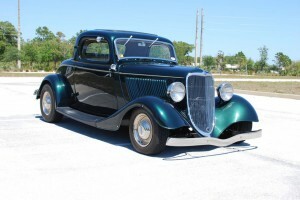 Offered for sale is this wonderful 1933 Ford 3 Window Coupe. 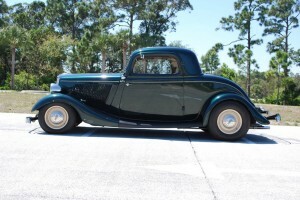 This is a steel bodied car that has fiberglass front fenders, lower rear valence, and trunk cover. This vehicle was finished approximately 10 years ago and was very well done. 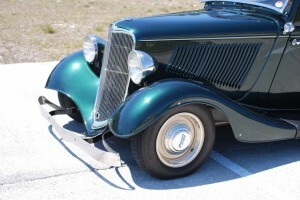 It features a nicely appointed Small Block Chevy, Turbo 400 Transmission, 4 Link Rear with HAL Coil Overs, TRW Rack and Pinion, Air Conditioning, Leather Interior, Power Windows, and more. The paint and finish on the car was very well done, however shows a few nicks from use. The interior is very nice. Leather seat, quality carpets, well done headliner, Billet Steering Column with Tilt, Leather and Aluminum steering wheel, Leather and Aluminum Door Handles, Billet gauge housings, Power Windows, and A/C. The paint finish is excellent and was very well done only showing a few minor flaws from use. The rear storage area is finished to match the interior. The engine compartment is very clean and well sorted as the photos will clearly show. The engine block has been painted green, and dressed with Edelbrock Intake and Carb, Aluminum coated headers, Mallory ignition, Finned Aluminum Oil Pan, Aluminum Air cleaner, Valve Covers, and supporting hardware. The firewall is finished to the same high quality as the exterior. The engine a mild performance engine with a smooth idle and great sound. 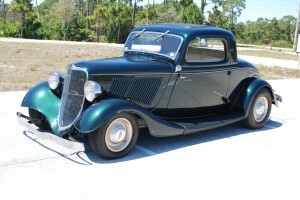 This car is being sold by the family of it’s builder and has been sitting for the last couple of years, and will need some attention to minor details. Please call 772.621.2622 for more info or details. The vehicle will be made available on appointment for inspection / viewing. Thank you.